A #1 New York Times-bestsellerSimon Snow is the worst Chosen One who’s ever been chosen. I never thought I would love this novel more than Fangirl. Fangirl made me laugh, smile and just reminisce my college life. However, with Carry On I was reminded that the fantasy genre could be light hearted. It had a plot which was full of romantic tension between Baz and Simon. I love them. They are the perfect gay couple for me. Rainbow Rowell has surprised me a lot. I loved Fangirl, but I love this story more. However, Landline was just okay for me because the ending just confused me. As for Carry On, it was just on another level. It could not be compared to her other novels. I love fanfiction and this certainly reminded me that fanfiction does have everything on it. The story did have different point of views which were not confusing. Also, I love that both characters are queer. I gave this story a five hearts and more rating because I just love it. I could read it again and again and again.The reading experience was fun that I could have read it without sleeping. It was light and funny because of the witty banter between the characters. Somehow, Simon’s obsession with Baz just made you wonder if he liked him. Baz and Simon’s relationship was not awkward to read. It was not cheesy but still it had just the right amount of romantic excitement or “kilig”. They both bickered like married couples. I did not like Agatha. For me she was two faced and just wanted to be perfect with Baz or Simon. The ending was very cliche but what mattered most for me was how the ending happened. I’m just happy that Simon and Baz are an item and this is what matters most to me. BUY, BORROW, NEVER MIND: Buy, because it is a feel good read where love is for every one. Disclaimer: This review is my honest opinion on the story. I did not receive any kind of compensation for reading and reviewing this book. I am under no obligation to write a positive review. 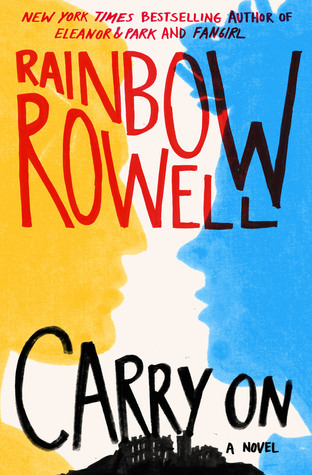 I purchased my own copy of Carry On by Rainbow Rowell. The book photo and synopsis here is from goodreads.com.